It appears as though TS Isaac is having a difficult time organizing, which is keeping the intensity down. The storm does have a rather low pressure at 979 mb tonight, which would lead me to believe that some intensification should occur overnight. The winds have not responded to this low pressure though and remain at 60 knots or 70 mph. This is good news as the track appears to be set for landfall south-southeast of New Orleans, with a movement to the northwest, but south and west of the city. This will lead to some significant storm surge and flooding around the city, but hopefully the levee system will be able to keep up. 00z 08/28/12 track guidance for Isaac. 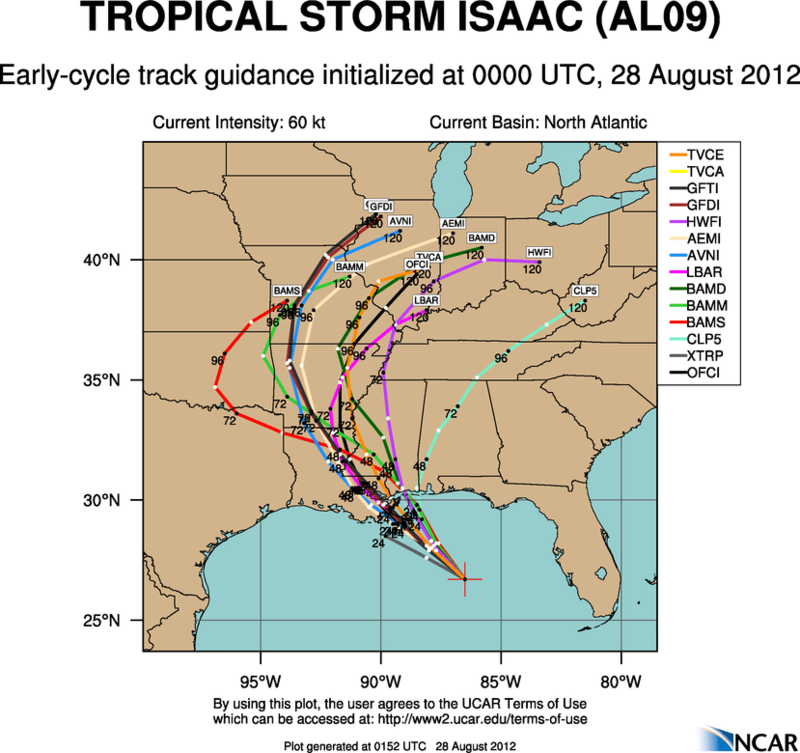 As you can see above, the track guidance for Isaac has changed little today giving me more confidence in the landfall location. The intensity forecast is another story. The wind field is large with Isaac, so even if the storm isn’t a Category 2 at landfall, there will be quite a bit of water flowing into Lake Pontchartrain tomorrow night. With a track to the southwest of New Orleans, the wind will continue pushing water towards the city well into Wednesday. There will also be the possibility of tornadoes from Southeast Louisiana to the panhandle of Florida. GOES-13 “Rainbow” satellite animation of Isaac. The satellite animation above (click on the image to animate) shows a storm that is struggling to get organized tonight. The culprit is dry air and light shear in the eastern quadrant of the storm. This is good news in that Isaac will most likely not strengthen above a Category 2 hurricane and even that is becoming less likely. HPC Day 1-5 rainfall forecast for Isaac. What will be a major issue with this storm is rainfall. As you can see in the graphic above, the Hydrometeorological Prediction Center (HPC) is forecasting upwards of 16″ of rain just east of New Orleans into southern MS. Flooding is starting to look like a real problem as the storm will slow down upon landfall. Bottom line: Areas from Jennings, LA to Lake Charles, LA are starting to look better, but will not escape heavy rain and gusty winds tomorrow night through Wednesday. Areas from Lafayette, LA to Biloxi, MS will see the worst conditions with very heavy rainfall, very strong winds, and tornadoes possible from New Orleans on east. There looks to be a serious storm surge risk from southeast LA to about Mobile, AL. Florida will start to dry out, but there may still be some rainbands for western Florida on Tuesday. I hope everyone has gotten prepared and now we will hope for the best. Thanks for reading! Next Post Hurricane Isaac to be a Pest!